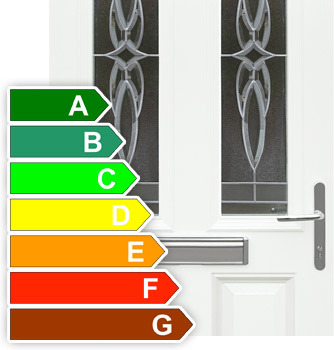 A thermally efficient door is essential to your home, as this is one of the most common areas for heat loss. With our doors we try to ensure that your new composite door is as efficient as possible starting with the foam core add to this the option to include a thermal glass upgrade which deflects cold air better than the standard where argon gas is used between the glass panes and warm edge spacer bars to seal the units. The thermal glass upgrade is available on the vast majority of our glass designs. Green credentials are best displayed by the durability of the product – if it lasts for thirty plus years without the need for replacement or constant redecoration that has to save a lot of trees and atmospheric pollution. Our composite door will stand the test of time without deteriorating in quality or appearances and are manufactured as far as possible with inert materials an example of this is the foam core used to construct the door which is 100% CFC free.